Johann Sebastian Bach was born at Eisenach into a musical family and in a town steeped in Reformation history, he received early musical training from his father and older brother, and elementary education in the classical school Luther had earlier attended. Throughout his life he made extraordinary efforts to learn from other musicians. At 15 he walked to Lüneburg to work as a chorister and study at the convent school of St. Michael. From there he walked 30 miles to Hamburg to hear Johann Reinken, and 60 miles to Celle to become familiar with French composition and performance traditions. Once he obtained a month's leave from his job to hear Buxtehude, but stayed nearly four months. He arranged compositions from Vivaldi and other Italian masters. His own compositions spanned almost every musical form then known (Opera was the notable exception). 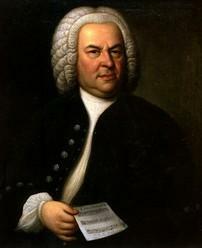 In his own time, Bach was highly regarded as organist and teacher, his compositions being circulated as models of contrapuntal technique. Four of his children achieved careers as composers; Haydn, Mozart, Beethoven, Mendelssohn, Schumann, Brahms, and Chopin are only a few of the best known of the musicians that confessed a major debt to Bach's work in their own musical development. Mendelssohn began re-introducing Bach's music into the concert repertoire, where it has come to attract admiration and even veneration for its own sake. After 20 years of successful work in several posts, Bach became cantor of the Thomas-schule in Leipzig, and remained there for the remaining 27 years of his life, concentrating on church music for the Lutheran service: over 200 cantatas, four passion settings, a Mass, and hundreds of chorale settings, harmonizations, preludes, and arrangements. He edited the tunes for Schemelli's Musicalisches Gesangbuch, contributing 16 original tunes. His choral harmonizations remain a staple for studies of composition and harmony. Additional melodies from his works have been adapted as hymn tunes.